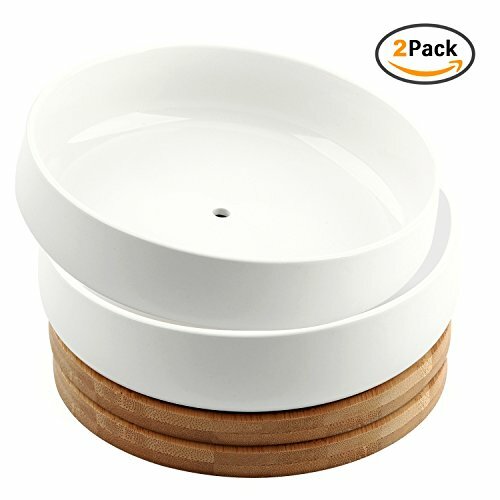 6 Inch Modern White Ceramic Round Succulent Cactus Planter Pot with Drainage Bamboo Tray,Decorative Garden Flower Holder Bowl（Pack of 2） by Encheng at Tulips Orchids. MPN: 4336471330. Hurry! Limited time offer. Offer valid only while supplies last. Quality you can count on, made from durable materials Like all StarPack products, these mini ceramic succulent pots are made with quality materials. Like all StarPack products, these mini ceramic succulent pots are made with quality materials. Each pot features a drainage hole - so important for succulents! - and a bamboo tray to catch drips. We also include a Guide to Growing Succulents with your purchase to get you started! These little pots are so versatile - they can be filled with succulents and given out as elegant party favors, last minute teacher gifts, and even place settings for a beautiful DIY wedding. The creative uses are limited only by your imagination! Ideal on any tabletop surface to display small potted plants, candles, and other decorations. If you have any questions about this product by Encheng, contact us by completing and submitting the form below. If you are looking for a specif part number, please include it with your message.